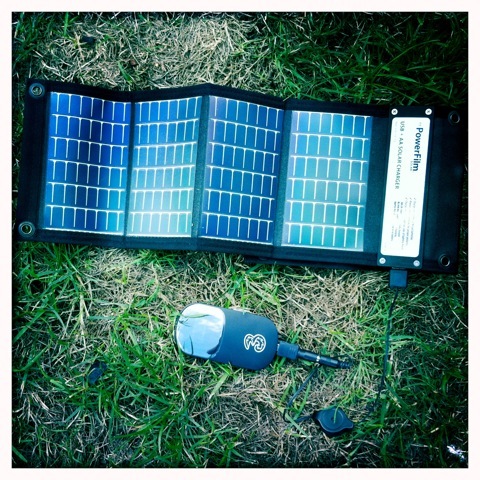 I got my hands on a test unit of the PowerFilm USB+AA Solar Charger from @Select_Solar. It’s about the size of a wallet when rolled up and as well as a USB socket it has a holder for two NiMH or NiCd AA batteries. It comes with two 2000mAh AA Sanyo batteries and states that it will solar charge the batteries in around 4 hours. Which is about the maximum amount of decent sun we get in a day so that’s pretty handy. It fits in the smallest of pockets, weights only 140g but still provides 1.4W (0.4A @ 3.6V). The panel tech inside this small unit seems to allow decent light absorption from even the cloudiest of days. So far I have tested it charging a Three MiFi while simultaneously providing a WiFi hotspot.. Charging the batteries for a Kodak Zi6 HD camera and all versions of the iPhone (with the AA batteries in place). If you are going to use USB equipped solar panels with your Apple devices always use the white apple cables where possible. Third party cables sometimes just don’t work. I’m sure this may keep Apple busy selling over priced cables in bulk but it’s hardly handy if all you have to hand is another make of cable.. It seems pretty shot sighted when the rest of the world seem to be moving towards the standardised Micro-USB. I am sure you will have no trouble charging other types of phone. I also have my hands on some slightly larger solar tech big enough to comfortably charge/power an iPad but that’s going to take a little more testing till I can publish my findings. I’m @Documentally on twitter and I would like to thank @Select_Solar for the loan of the PowerFilm USB+AA Solar Charger.